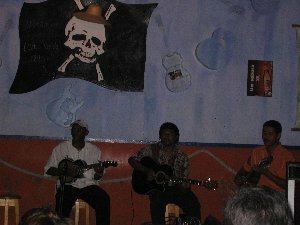 There is live music to be heard in many bars and restaurants in the evenings. 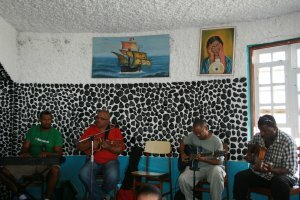 Each island has its onw style of music, often with different groups of instruments. Music has developed separately on every island over centruies . but it all owes its origins tro Portugues and African folk music. The quality varies greatly but it is generallly reckoned to be best on Sao Vicente, the heartland of Cape Verdean music and birthplace of Cesaria Evora and many other famous Cape Verdean performers. Here many places such as the Yacht Club and the Chez Loutcha hotel offer live music every evenings. So do several cafes. There are several music festivals. Baia das Gatas ("Bay of Sharks") is the most famous local music festival.It is held on the beach in the first or second weekend of August. Inspired by Woodstock the 'Festival de Musica da Baia das Gatas' has bands from mostly tropical countries playing many musical styles.Some 35,000 visitors now camp on the beach. After dark, it becomes an open-air night club, with dancing, and people, playing bisca and drinking grogue. As well as Cape Verdean music, you can hear Jazz, Rap, Samba, Latin, Reggae, African and Fado. 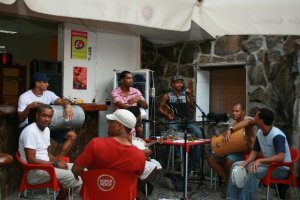 Among the more famous Cape Verdean groups are Voz di Cabo Verde which was founded by Luis Morais, Bana, and Morgadinho. Ti Lis, as he is affectionately known, pioneered Cape Verdean music. 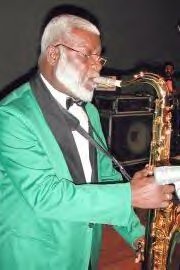 A favourite song is Boas Festas, the Cape Verde`s most popular song, a reminder of times past when Luis Morais would walk the streets of Mindelo with his clarinet . The group Sonhos Sem Limites dance in Carnaval costume to the sounds of Batucada. Bau, Jenifer, Gabriela and Djoia play traditional music on the violin and clarinet. Dub Squad from Mindelo play Reggae. Philip Monteiro often plays Ti Lis` songs with his first band in the US. Kompass, Cesaria Evora`s base group, backs her, Gerard Mendes, Abertino, Lutchinha and Constantino. Rappers Hip Hop Art have a funny repetoire.Djosinha, a Cape Verdean from New England, plays his butterfly, mixing with the audience and singing along. Among the special musical genres are the Funana and Mornaand Cape Verdes most famous singer is Cesaria Evora. There is also church music which KK from Scotland enjoyed. "Christmas eve we went for a drink and sat outside a bar across from the church near the square people started going in at 10-45 it was lovely to see all the families going to church by midnight it was jam packed. There was an open air service there on the Sunday afternoon that was also packed. New Years eve we were walking round there's a smaller church on one of the other roads people were going in we went in they were singing gospel music it was very interesting to see. "